Spokane Ponderosa is dedicated to the revitalization of Spokane County's urban Ponderosa Pine forest. We would love to see your Ponderosa Pine sales increase to the point that you can't keep up with demand. We need your help to accomplish this. We'll promote the trees which will increase your sales; in return we ask that you grow the best quality stock available! We have heard from Contractors on a number of occasions that Ponderosa Pine is their number one tree for warranty issues. Tree mortality can be prevented. In most cases of new installation death, mistreatment of the root ball between nursery digging and installation is to blame. On occasion, tree mortality is caused by root issues that began at the grow yard. A recent installation project in Spokane suffered over 90% Ponderosa Pine mortality within a short period of time. The tree stock was reviewed by an independent arborist on behalf of the project Landscape Architects. 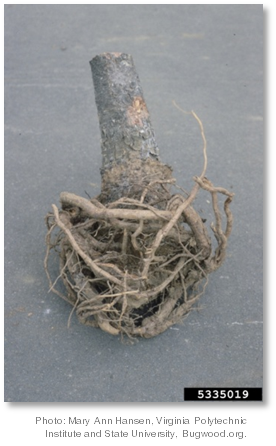 The deceased trees were found to have a number of root abnormalities caused by improper growing at the nursery level. Because of the sensitive nature of Ponderosa Pine water intake during establishment it is vitally important tree stock has an adequately developed and prepared root ball. The majority of root abnormalities seen in field growing can be corrected by proper training of seedling installation staff. The majority of Ponderosa Pine tree stock is field grown then balled and burlapped just prior to shipping. The typical Ponderosa Pine root structure consists of a tap root and lateral roots roughly 20” below the surface. Commercial nursery field digging is usually done with a hydraulic tree spade. Tree spades dig a conical shaped root ball cutting off the tree's tap root and lateral root structure. Field digging removes the majority of the tap root and much of the root structure. Use of the field growing and digging method shows how vitally important it is to keep the root ball watered throughout the transport and replanting process. 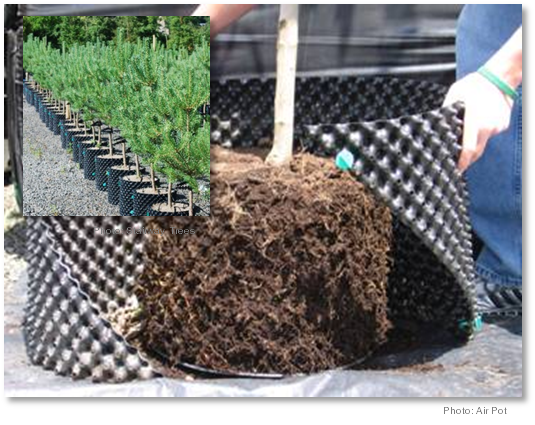 Growing containerized stock can overcome the problems associated with field growing Ponderosa Pine. J. Frank Schmidt and Son Co. in Boring, Oregon is one of the largest deciduous tree growers in the Northwest, and they grow in containers. The containers they use are made by Air Pot, an excellent example of innovation at work in the nursery industry. Another alternative is to containerize B&B Ponderosa until they re-grow feeder roots to better survive placement in the landscape. This is a common practice by the City of Spokane Urban Forestry Department which has had a substantially improved survivability rate with their Ponderosa Pine.